Along Central America’s Pacific coast you’ll find rocky outcrops, world-class surf, and some of the most jaw-dropping views in the world. 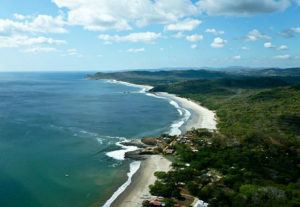 If it’s natural beauty you are after, Nicaragua is the jewel of this stretch of coast. Today’s Nicaragua is like a newborn child, eyes bright with hope with a smile promising a great future. The country stuns with its physical beauty, something that surprises every newcomer. Majestic volcanoes pepper the horizon along the Pacific Ring of Fire, some with billows of white smoke, proclaiming the life within, while others sleep, protecting their sparkling crater lakes for you to enjoy. Lake Colcibolca, the 19th largest lake in the world, houses Ometepe Island, a magical place that soothes the soul with its own lakes, volcanoes and verdant green forests. White sand beaches and turquoise water with low-hanging palms greet you on the Caribbean side of Nicaragua. Bosawas National Reserve offers a dense rainforest, second only to the Amazon in the Western Hemisphere. Hiking, rock climbing, floating down crystal clear rivers, surfing a volcano and more are only some of the adventures in Nicaragua. Because Nicaragua is just emerging as a tourist and retirement destination, many take advantage of the economical real estate and rental prices to retire early. Ocean-view condos for under $100,000 still exist, as do fully-furnished apartments to rent for $400 to $500 a month with all amenities and a block’s walk to the beach. Don’t despair if you want “more” of a house, as upscale mansions with a 240-degree view of the ocean exist for those with deeper pockets. The truth is, you can easily build your dream house and your dream life in Nicaragua, for about an 8th of the price of what it would cost you back home. Still lacking a strong infrastructure, Nicaragua, like Costa Rica maybe 40 years ago, offers people from the U.S. and Canada and elsewhere the role of true pioneers. These expats are helping to shape Nicaragua into the tourist mecca it will become. New government laws with unparalleled tax benefits help expats form corporations and open businesses with ease. Nicaragua is not for everyone. It’s more primitive and wild than its Central American neighbors. It’s for the young-at-heart, who don’t worry if the electricity goes off, who don’t stress over guests arriving late, and who don’t want to sit around just watching TV when they retire. It’s for those with vision, who want adventure, want to feel young again, and who want to create their ideal retirement. Don’t wait any longer. Let Nicaragua surprise you. I’m kind of a thrifty guy. I don’t buy the latest smartphone that comes on the market. In fact, I have the most basic model money can buy in Costa Rica—just $30, plus $15 a month for minutes. I don’t splurge on fashion—why bother? I’m in board shorts and a tank top pretty much 24/7 at my home in the Costa Rican beach town of Tamarindo. But when I travel to Nicaragua, I go a bit hog wild and feel free to indulge in many of the “luxuries” I normally deny myself. Nicaragua is now cool. And Granada is at ground zero of the new, cool Nicaragua. Yet there never has been a better time to buy a colonial home in Granada. I’ve followed the real-estate market here closely since my first visit in 2004. Through boom and bust I’ve watched prices fluctuate. And on this visit I saw a 900-square-foot home, a short stroll from the historic center, with an asking price of $39,000. Expats who live in Nicaragua are able to enjoy living in an amazing country that offers a low cost of living in combination with a high quality of life. Nicaragua is home to a vibrant culture with friendly people, spectacular beaches, and an amazing early-in real estate investment opportunity. Benefits to legal retirees (i.e. those with a resident’s card) come mostly in the form of tax incentives. As a foreign retiree, you are entitled to: Pay no taxes from money earned in other countries. Read More : Why Nicaragua?